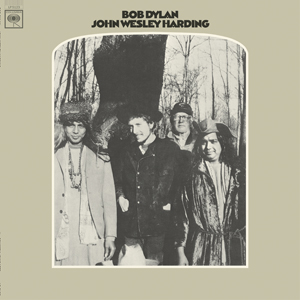 “John Wesley Harding” was Bob Dylan’s somewhat low-key 1968 album release. After the glory that was “Blonde On Blonde“, from two years earlier, Dylan had suffered a motorcycle accident and had gone low profile for a year or so. He had recorded some material with The Band, but otherwise he had gone to ground, tired of the stresses of being incredibly famous. Briefly, he had had enough of the whole thing and it deemed his muse had deserted him, to a certain extent. He was back in 1968, after The Beatles, The Rolling Stones and The Beach Boys had produced, or were in the process of producing, works of high quality, so he returned with an almost deliberately low-profile, laid-back album of folky songs. Based around acoustic guitar, a melodious bass, some trademark harmonica and a gentle drum sound, there were no extended works of genius on here, like “Desolation Row” or “Sad Eyed Lady Of The Lowlands”. Just a collection of sensitive, often quiet, reflective songs with a fair amount of biblical references dotted around in the lyrics. It must be remembered that this album was released into a maelstrom of psychedelia and full-on electric stuff from Jimi Hendrix, Cream and the like. To revert back to quieter, tuneful folky, country-influenced material was a huge move. It also pretty much kick-started the “country rock” genre. Crosby, Stills and Nash were waiting in the wings. I feel this album has been unfairly overlooked in many ways. It was as ground-breaking as any other album he produced, and more than that, it was simply a good album. It is certainly deserving of a place in any “Dylan Top Ten Albums”. The title track was a mid-paced gentle beat song about a Western gunfighter with an addictive bass line that sounds great on the mono recording. “As I Went Out One Morning” also has a simply wonderful deep, tuneful bass line and an insistent drum sound and some mysterious lyrics, together with some trademark Dylan harmonica. 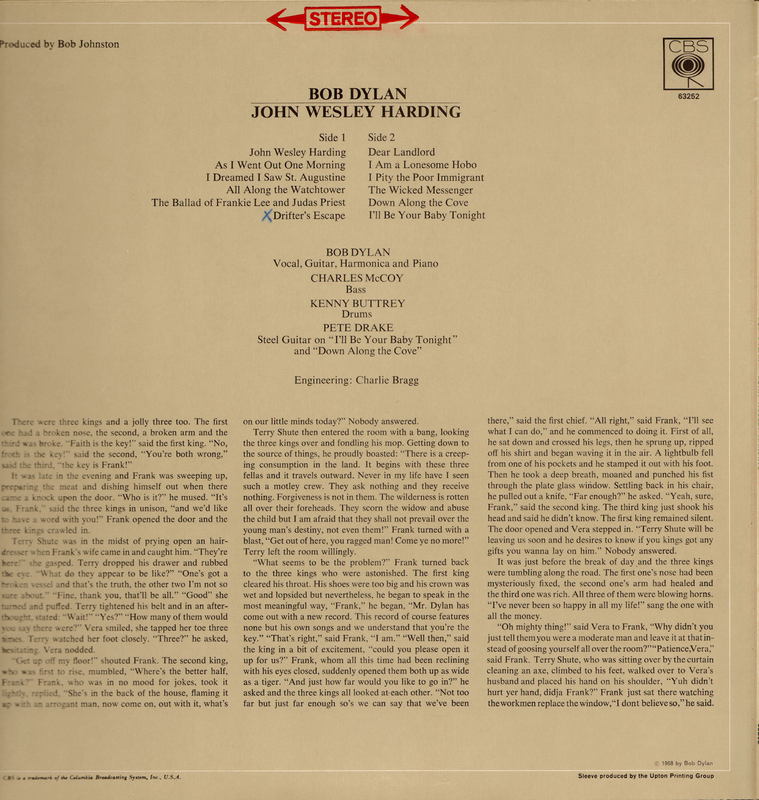 This continues in the appealing slow paced “I Dreamed I Saw St. Augustine”, which saw Dylan in good lyrical form and a delivery similar to “that wild mercury sound” aimed for on “Blonde On Blonde”. It is one of the album’s best tracks, full of imagery, mystery and intrigue. Up next is the iconic “All Along The Watchtower”. Everyone seems to prefer Jimi Hendrix’s version, even Dylan, but I like the stark, bleak, storm-gathering portentous feel of the original as presented here. It is a great big cynical warning of doom and its contemporary effect cannot be underestimated. The high quality continues with the album’s big narrative tale , that of “The Ballad Of Frankie Lee and Judas Priest”. Full of great lyrics, Western imagery and wonderful characterisation. A forerunner, in many ways, of “Lily, Rosemary & The Jack Of Hearts” from 1974’s “Blood On The Tracks”. Again, an impressive thumping bass on this. “Drifter’s Escape” is a harmonica and shuffling drums-dominated number, with, again, some perplexing lyrics. “Dear Landlord” is a piano-driven “Mr Jones” style slow, well-delivered ballad with crystal clear sound throughout. Yet again, I have to say that the bass is phenomenal. “I Am A Lonesome Hobo” is a superb, bass-driven, lyrically sharp and musically uplifting number, one of the album’s best. Insistent, questioning, wise - Dylan on top form all round. “I Pity The Poor Immigrant” is a plaintive, sensitive song that harks back to the “protest” songs of the early sixties. It would not have sounded out of place on “The Times They Are A-Changing”. “The Wicked Messenger” is an upbeat, rocky number with echoes of the “stream of consciousness” lyrics and electric sound of “Subterranean Homesick Blues” and Chuck Berry's "You Can't Catch Me". “Down Along The Cove” is another faster-paced bluesy number slightly reminiscent of Van Morrison’s Them with hints of Georgie Fame’s “Yeh Yeh”. It finds Dylan in unusually playful mode, musically and vocally. The most “fun” track on the album. “I’ll Be Your Baby Tonight” is a gentle, country style romantic number that hinted at the material that would populate future albums like “Self Portrait” and “New Morning”. 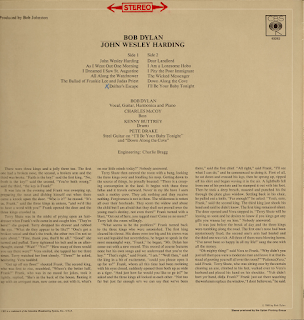 Regarding the sound, the album sounds great in stereo, but it is the only one of the “electric” era Dylan albums that has a very good case for sounding better in mono. The mono really brings the bass to the fore. It sounds great. I prefer “Highway 61” and “Blonde” in stereo. This one, I am not so sure. There is a real power, clarity and attack on the mono version. The bass is just beautiful. “The Wicked Messenger” is a good example, on the stereo, the descending bass “riff” bit is, for some inexplicable reason, much quieter. Pretty unforgivable, to be honest. The stereo is more subtle, more melodic, but for me, I think, on this occasion, the mono wins.